What are the best practices when working remotely? The idea of this guide and the idea of working remotely were originated and inspired a Cape Town based company Clicks2Customers. I was very fortunate to have the opportunities to work with Clicks2Customers on 2 separate spells. The first time was when I was working from the head office of Clicks2Customers in Cape Town in 2006-2007. The second time was when I was based remotely in Shanghai and Hong Kong which started in late 2013. I have great respect to the people who I have worked with at Clicks2Customers. The forward thinking operations of this Cape Town based company have provided me with game changing opportunities that I could never have thought of and experienced with most of the more traditional thinking companies. I have been working remotely for quite some time. During my remote work period I have worked with at least some 50 people from across the world in different time zones. We had to overcome obstacles such as long distance communications, etc. We have collaborated through some online tools and have managed to accomplish many tasks and projects. In my guide, I am sharing my hands-on experience and my own thoughts on one topic: How to best set up yourself in order to work from remote locations. In a conventional business environment people work from offices between 9am-5pm. Each work day people commute between their homes and offices. The concept of working remotely depends on different circumstances and does not mean you work without an office or you have to work directly from your home. the project in which they are located in at least 4 different remote locations. Your main function for this project is to provide full technical support to the client in implementing the analytics solutions on to their website. You are required to communicate effectively and efficiently with other team members and the client’s project team. Due to your remote location, you are not required and do not have the opportunity to meet face-to-face with any member of the project. Internet phones, emails, web-based collaboration tools and other electronic means of communication are your only and important communication tools. What are the important factors to consider someone being suitable for remote work? When working remotely, sharing the same time zone with the people you are working with is a basic requirement. Even when working from a remote location, you will likely stick with similar work hours every day. That is, you work from 9 am to 5 pm from Monday to Friday. For instance when all the team members you are working with for a project are exactly 12 hours behind you, their office hours are most likely during your late evening or mid-night hours. This time zone difference does not really give the team members and you overlapping work hours. Often real-time communications can only happen when both sides have at least several hours overlapped. Some extremely complicated projects will most require two sides have regular video conferences in real time. Many projects that involve over 5 members will often require regular update sessions in real time. Being able to speak a common language is another requirement. If you can speak very little English and often struggle to express technical terms in English, but your team members can only speak in English, time will mostly be consumed unnecessarily on long communication sessions without much progress. You hire the talents, not the cheap. Let’s go back to the website design and Internet marketing agency. The agency should hire you to work from a remote location not because you are much cheaper, e.g. Your pay is only half that much of another staff working from the head office, while the two of you perform the same type of work. You are hired because you are a great team member and can contribute through your specialized skills to projects the same way as any of the head office staffs. Many companies may already be facing the reality. In the city where your head office locates, you find it more and more difficult to hire the talents who have the most required attributes. You are looking for people who can work with your current employees, who already have the required specialized skills, and who are able to learn sufficiently fast to catch up the ever-changing technical knowledge. It doesn’t matter where this person is based. As long as he/she fits into the above profile, you should hire him/her to work from remote. Pay him/her a decent salary that is competitive in the market, and get him/her to fit into the process of your projects with the help of other experienced staffs and some effective collaboration tools. Often people have to relocate due to many personal reasons. For example, your best web designer is getting married and she has to move from your head office (i.e. New York) to where her spouse is (i.e. Los Angeles). In the past 5 years, she and your head office teams have already established a great working relationship in the past 5 years, and she has already integrated seamlessly into your company’s work process. Her departure means you are losing a great asset to the company. Hiring a new web designer to replace her quality and having the new person to fit into the process will take quite some time. One possible solution is to let her work remotely so she can continue with the current projects. While letting your web designer to work from her new remote location, you must build an entire supportive infrastructure. This supportive infrastructure will not only benefit this specific web designer, but will also make the remote working lives much easier for all other staffs working from all different remote locations. Communication Tools: Internet phones (e.g. Skype), video conference tools (e.g. Webex, Google Hangouts), emails and instant messaging tools (e.g. Whatsapp, WeChat, etc). Online collaborative tools (e.g. Basecamp, Podio, etc) where you can create projects, create tasks, log work progress, write notes, and upload files. And then you can share projects, tasks, work progress, notes, and files with the selected people who are involved in the same project. 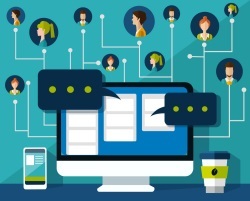 The work process must be full integrated into your company’s major online collaborative tool. For instance, in the tool the progress of all the tasks must be tracked, and all the projects or tasks must be assigned to owners who will subsequently work on the projects or tasks. In your main collaborative tool, you will need the real work process in there. One of the best people to work remotely is someone who has been with your company for a long time, already understands your company process, and already knows all the people from your head office. When you send a staff member who has been working from your head office for multiple years to work from a new remote location, he/she will be able to start operating efficiently and effectively again as if he/she was working in your head office. You will have to be organized with your actual work and your time management. You should regularly back up your work file. Store all your work files under a backup folder within your company’s online collaborative tool or an online cloud storage, in case your local computer runs into hardware issues or data lost issues. You should integrate your entire projects into your company’s online collaborative tool. Everything related to the project includes files, drafts, prototypes, documents, notes, meeting minutes, tasks progress, etc, should be captured within the tool. Information and/or files related to group work must be accessible to the appropriate persons. morning and checking-out every evening. which would have given you a total of 8 work hours per day for 5 days. Being able to write clearly and in clarity is an important requirement for someone to work remotely. You may not be a great technical writer, but you will definitely need to be a great writer. Start with writing down the clarification of the problems and/or projects that you are going to work on. This will allow other people to understand the scope of the project or the severity of the problems they are going to be working on. Break down the problems and/or projects and explain each part of the problems and/or projects in details. Another advantage of being able to write is that often (even though most people never do it) you should write summaries or in details of a problem that you have already resolved or a project you have completed. The summaries that you have written down can be used as references for people who will handle similar problems or projects in the future. These summaries and/or work details should be updated on to your company’s online collaborative tools. You need the ability to learn fast, or the willingness. Being able to quickly learn new methods in order to work remotely – Learn how to use an online collaborative tool in a week. Be your own IT support – At a remote location you may have no head office IT supportive available to any unexpected fault or breakdown to your Internet connection, computer, laptop, and/or mobile phones, and you will have to learn how to fix most IT issues on your own. Now you do not see people you are working with face-to-face. You do not get to lunch with them every day. The social part that was used to be in the work environment is now missing when you work remotely, and you will just have to manage and get used to it. Certainly you can still schedule to have regular short updates between other remote members and you. The regular update sessions can be as short as just 5-10 minutes and the objective is to talk a bit about your recent life in New York and their recent lives in London, Toronto or Shanghai. Immediately after the 5-10 minute social sessions, you can jump into the actual work discussions which are your regular project meetings or video conferences.